It’s Monday, and I am still basking in the afterglow of a girl’s weekend. My friend recently moved to Napa and invited me and another friend up for a girl’s weekend. 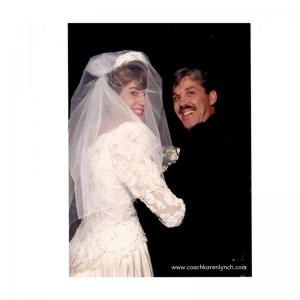 We had the typical plans laid out: fun, laughter, and wine – with one twist: we were going to open our hermetically sealed wedding gowns and bid them farewell before we passed them along. After I married, my Mom had it cleaned, preserved and stored; it had been sitting in a box, high on a shelf in the guest room at my parent’s home, untouched, unopened, and unseen by anyone for over 27 years. In my pursuit of Minimalism, my wedding gown is one item that I knew I’d have to figure out what I want to do with. Our friend who was joining us in Napa had sent her wedding gown off to the Angel Gown Program, a program that takes wedding gowns and sews them into small gowns for babies who never come home from the hospital. Several months ago, she shared the most amazing and beautiful photos of 25 perfect little white Angel gowns. Goosebumps go up and down my arms as I think about my wedding gown, worn at an event filled with love, joy, and new beginnings, that will then be repurposed to be used to help ease grief and despair. After seeing the photos of the baby gowns made from my friend’s gown, I knew donating to the Angel Gown program was the perfect solution for my own. On Thursday, I stopped by my Dad’s house; he had pulled the box down from the shelf and had it waiting in the kitchen. I shared my plans for the gown to my Dad; he suggested I hold on to the gown and asked the familiar “What if” questions. What if my boys wanted the gown? What if a niece wanted it? I put my hand on my father’s shoulder and told him that my decision felt right. He paused for a moment. “I remember how beautiful you looked in that gown,” he said. I could see his eyes well up. I gently reminded him that I had the most wonderful picture of the two of us, looking back at the camera, smiling, right before he walked me down the aisle. That photo was my favorite photo of my Dad and me. After a great afternoon of wine tasting, my friend and I pulled out our boxes holding our wedding gowns. The boxes were large, each with clear glassine windows that showed just the bodice and the intricate beading on each gown; they looked beautiful. I unsealed my box slowly, lifted the dress, and removed the tissue. Shaking it out, the gown was still lovely, despite some wrinkles and an odd color – it wasn’t white-white. My wedding gown felt sad and neglected. My friend and I donned our dresses – we could get them on but couldn’t zip them all the way up. The three of us laughed as we danced around to 90’s music, lifting our skirts so we wouldn’t trip over or rip the long trains and tulle. It was fun. It was silly. I had such a different feeling wearing the gown 27+ years later; it was as if I was just putting on a costume. This was not the feeling I wanted or expected. It was time to let the gown go. There was a more important need my gown would fill. As I pack the gown up and prepare it for shipment, I know the gown was infused with joy, silliness, and friendship before its journey to a seamstress who will convert it into gowns for little angels. I am happy. I am at peace. Julie – Thank you for inspiring me to donate mine. I loved “unboxing” with you!